Your home is the single largest investment that most people will make. Knowing how to care for and clean your home is essential to maintaining the value of this investment. 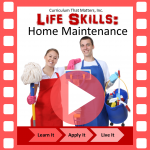 The home maintenance course will teach you some of the simple things you can do to take care of your home. You will learn about different types of floors and how to clean them. You will learn about different cleaners and how to create cleaning charts to help you keep it clean. You will also learn how to shut off the utilities in your home.